A superior and long-lasting solution that will revitalize your smile. The Art of 21st-Century Dentistry can improve your appearance, comfort, health and knowledge through a wide range of dental services using the most modern technology. Located in Newport News, Virginia, and serving patients in Wlliamsburg, Yorktown, and Hampton, as well as across the country and around the globe, Port Warwick Dental Arts utilizes a variety of remarkable technologies and treatments to enhance your dental experience and fulfill your vision for a beautiful, healthy smile. We are so grateful for your interest in joining our PWDA family. We have listened to our community and have learned that not all individuals desire the same level of dental care. Therefore, we offer levels of care, one of which we hope feels comfortable for you. Click here to read about the 5 levels of care and see which level is right for you. Dr. Samaha values the health of her patients and adheres to a holistic, whole body healthy lifestyle. She encourages healthy lifestyle practices, including positive nutritional choices that support teeth and gums. Having a healthy body promotes general good health, and this enhances her patients’ teeth and gums, and helps them have a beautiful smile. When making choices for her own dental protocols in her practice, she offers mercury safe dental care. There have been amazing developments in cosmetic dentistry recently. Whether you just want professional teeth whitening or to fix some discoloration, or if you are interested in correcting crooked teeth or closing spaces, our Portsmouth cosmetic dentist can help improve your smile. We’ll find a cosmetic solution that works with your budget and gives you the beautiful smile you’ve always wanted. Creating and maintaining a beautiful smile starts with healthy gums. Unfortunately, it is estimated that up to 85 percent of all Americans suffer from some form of periodontal (gum) disease. Unlike many of her peers who are also general dentists, Dr. Samaha is nationally recognized for her protocol for non-invasive gum disease treatment, which she also teaches to other dentists and physicians. Restorations, including dental fillings, inlays, dental crowns, dental bridges, and dentures, can save teeth that otherwise would need to be extracted. With the variety of materials available, including composite resin and porcelain, you can achieve lasting solutions to your damaged and decayed teeth. And with such restorative dentistry services such as one-hour crowns with Cerec, you’ll be looking and feeling better quicker than you think. With missing teeth, dental implants provide a superior solution to dentures or other temporaries. With their ability to be attached directly to your gums or jawbone, dental implants help stop progressive bone loss and shrinkage. Dental implants can give you the closest thing to the look, feel and function of your natural teeth. Our general dentistry services focus on preventing dental problems and helping you feel completely comfortable with your smile. We offer regular professional teeth cleanings and dental checkups every six months. Our general dentistry services play an important role in your oral hygiene and oral health. Interested in scheduling a dentistry appointment with Dr. Samaha? Looking to learn more about the dentistry services offered at our practice? Call 757-223-9270. 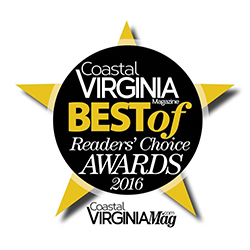 Once again, Dr. Samaha was chosen by her Hampton Roads colleagues as the Top Dentist.